Continuing his word war against former President Benigno Aquino III, Foreign Affairs Secretary Alan Peter Cayetano insisted that the Philippines lost control over the Scarborough Shoal under the previous administration. Cayetano's latest tirades come in response to Aquino's suggestion that the former's politics should be as "transparent as his hairstyle." "While we both lost some of our hair, your administration lost control of Scarborough and a great opportunity to expand tourism, infrastructure and agriculture," Cayetano said in an open letter to Aquino on Friday. The secretary told the former president that it was "regrettable" to compare their haircuts in response to questions on the West Philippine Sea dispute. Once again, Cayetano asked Aquino how the Philippines lost control over the Scarborough Shoal in 2012 and who was in command of the situation. Cayetano also questioned Sen. Antonio Trillanes IV's back channel talks with Beijing, noting that the senator made 16 trips to China as Aquino's emissary. "Sen. Trillanes had refused to reveal the purpose and nature of his trips when asked during a senate session by then Sen. (Juan Ponce) Enrile. Instead he walked out and invoked presidential prerogative so he would not be compelled to respond," Cayetano said. 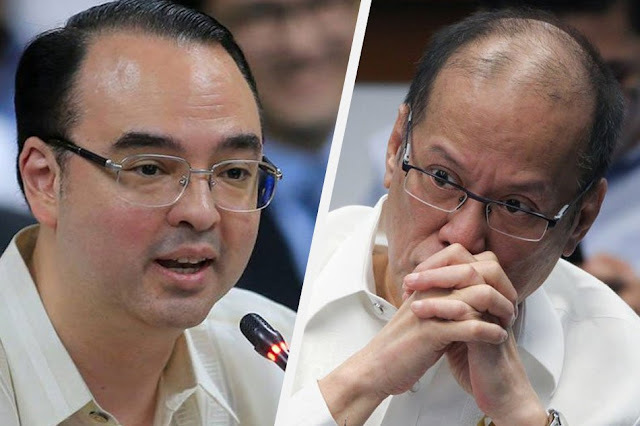 Cayetano asked for details on Aquino's previous meeting with former US President Barack Obama and whether the US made any commitment on the West Philippine Sea issue. "What did you discuss with President Obama? He reportedly affirmed to Japan that the mutual defense treaty will be put into action if the Senkaku islands are threatened. Did Mr. Obama tell you that the US does not get involved with territorial disputes like in the WPS?" the DFA secretary said. Aquino was also asked for his proposals for oil and gas exploration in the disputed waters. Cayetano urged Aquino for alternatives or proposals on the matter instead of merely criticizing the Duterte administration. "Our people await your response to these questions in earnest, to be fully informed finally of the background of our complicated situation," Cayetano said. On Tuesday, Cayetano challenged Aquino to ask former Foreign Affairs Secretary Albert del Rosario if he was transparent on his dealings with China. In response to this, Aquino pointed out that transparency was the hallmark of his administration. “He and I both have a transparent hairstyle; hopefully his politics, too, could be transparent," Aquino said. Trillanes, Alejano to join PRRD in Israel trip?